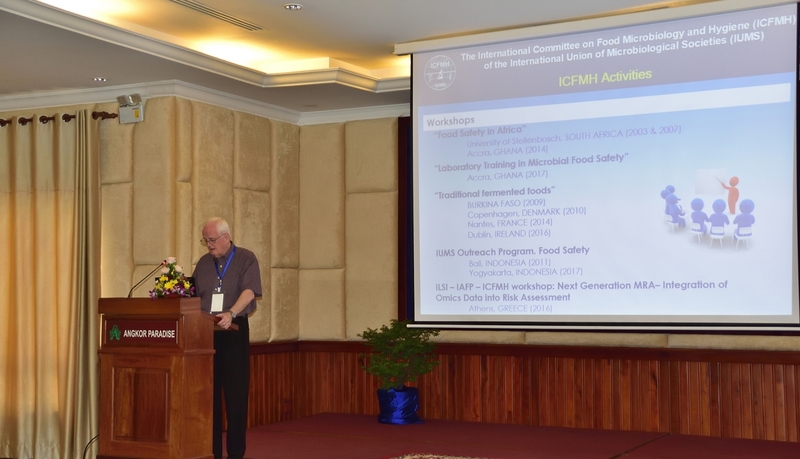 Professor Larry Beuchat (ICFMH Vice-President) and Dr. Thong Kong (local host, Dean of the Faculty of Agro-industry at the Royal University of Agriculture, Cambodia) delivered welcome speeches. Drs. L. Beuchat, L. Cocolin, J. Corry, W. Fang, M. Jakobsen, T. T. Myaing and M. Yue gave lectures on novel molecular technologies and their application in detection and source-tracking of foodborne pathogens, holistic approaches for microbial food safety management along the food chain, and EU and US food safety requirements for imported food commodities. 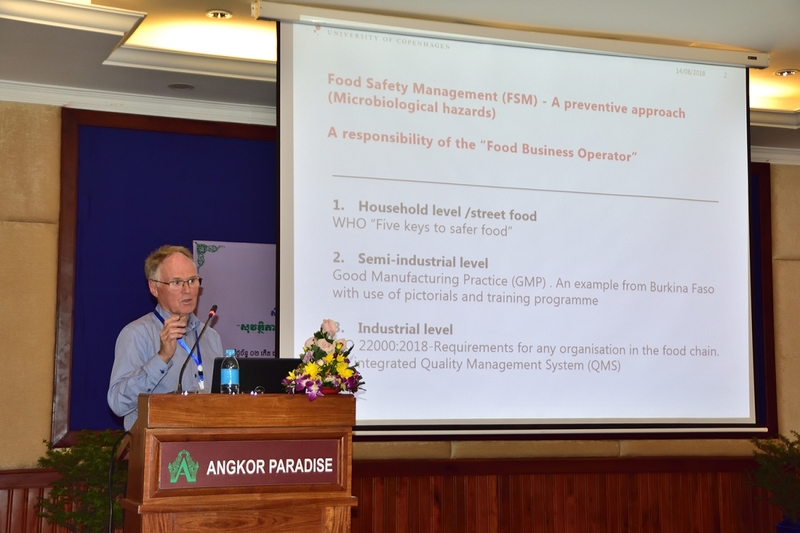 Participants involved in food production and processing gave presentations on GAP, GMP and HACCP as implemented in the region. Overall situations of microbial food safety in the region were also presented by the country representatives. It is apparent that systemic approaches for microbial food safety risk management along the chain are lacking. Discussion during the workshop led to a conclusion that a regional network focused on microbial food safety should be built to address the food safety issues in a stepwise approach, with initial involvement in using standardized protocols of both molecular and traditional technologies to understand the importance of major pathogens in major food products and their implications in foodborne disease outbreaks. The network ‘SEA-FPD’ (Southeast Asian Foodborne Pathogens and Disease) would be multi-national and multi-sectorial, involving public health and agricultural agencies and research institutions within and among the countries. Professor T. T. Myaing (Myanmar) was nominated as the coordinator of this network. She will be joined by Dr. S. Leang (Cambodia), Mr. T. Bounyasouk (Laos), Mr. N. Paudyal (Nepal) and Dr. D. S. Mai (Vietnam). Dr. W. Fang will represent ICFMH for liaison with the SEA-FPD network. Group picture of the Workshop lecturers and participants.